On April 26, 1986 reactor number four at the Chernobyl Nuclear Power Station in northern Ukraine exploded, throwing up enough radioactive material to contaminate much of Ukraine, Belarus, Russia and other parts of Eastern Europe. Thousands of people were evacuated from the 30 km Exclusion Zone, abandoning homes, schools, entire villages, and a way of life. Inside and outside the Exclusion Zone, the reduction of human activity has led to the rebound of plants and animals, particularly large mammals, since the initial loss of life. The area is regularly evaluated by government workers and researchers from around the world; it is explored, illegally, by risk-taking adventurers in what seems to be this millennium’s new frontier—abandoned cities more phantasmagorical, with their crumbling infrastructure and skeletonized machinery, than a wild west ghost town. The Exclusion Zone has also become the home of old women who defied orders to remain in Kiev after resettlement, or who refused to leave in the first place. These women are now referred to as “the Babushkas of Chernobyl,” and the eponymous film about them, directed and produced by Holly Morris and Anne Bogart, focused a light on their enigmatic lives. The Babushkas are beyond child-bearing age and its risks. Their village homes are, in many cases, mere huts. 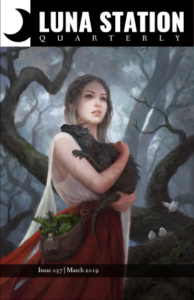 In their isolation they remind me of the Russian fairy tale character Baba Yaga, for what is a crone but a woman alone, or with one or two of her kind, deep in the woods, in a hermit’s hut with hung-dry herbs and an iron kettle bubbling on the fire, spitting drops of the broth of some creature’s bones. Ironically, the grandmothers of the Chernobyl Exclusion Zone are robust compared to their age cohorts who did not remain and have, in many cases, died from broken hearts. These women are in their 70s and 80s, they farm and hunt, brew moonshine, bake, and smoke. Their strength and humor belies the invisible danger that lurks in the water, the soil—everywhere. They aren’t unaware of the risks, just not impressed by them. They lived through the purges of Stalin and the horrors of WWII and are determined to continue living in their homeland, applying their skills and their accumulated wisdom to the job of living as their mothers and grandmothers had. While they live, they are reminders of the healing power of being where you most want to be and doing what you most want to do. In the Exclusion Zone, the danger of radiation, the invisible omnipresent menace, is real and deadly. And like Baba Yaga’s brand of magic, it attracts uninvited visitors willing to risk harm in order to seek the thrill of exploring hidden wild places where beasts and mysterious old women live. It is tempting to think that the wild place of the Exclusion Zone, where it can be imagined life is reduced to its enchanting elements, is a good place to be. The kind of temptation that emanates from Baba Yaga’s realm. A line that applies to each of us, inside and outside of Baba Yaga’s wood. Pinkola Estés, Clarissa. Women Who Run With the Wolves: Myths and Stories of the Wild Woman Archetype (New York: Ballantine Books, 1992), 114. Pilinovsky, Helen. 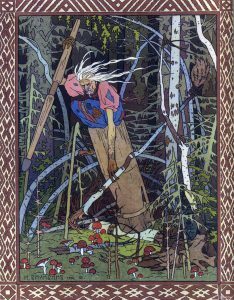 “Russian Fairy Tales: Baba Yaga’s Domain.” Journal of Mythic Arts, accessed April 22, 2017, http://endicottstudio.typepad.com/articleslist/baba-yagas-domain-by-helen-pilinovsky.html.